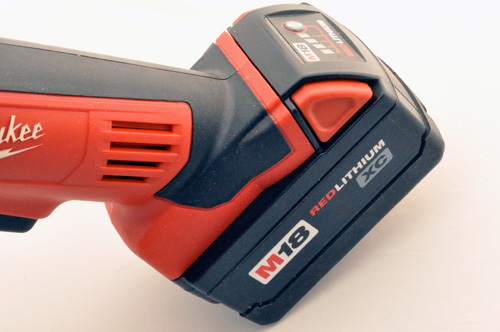 At the 2011 Milwaukee Tools Symposium in July, I saw a ton of cool tools like their new hand tools and fluorescent bulb tester. 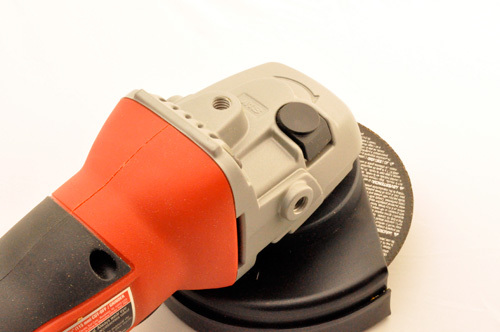 Another offering that caught my attention was a 4-1/2″ cordless cutoff / grinder. The specifications on this grinder are nothing new: paddle-switch; 9,000 RPM; tool-less accessory changes; etc. Even so, none of the competition has a grinder with the same combination of features. Milwaukee sent me their cordless grinder (catalog #2680-20) a couple months ago. Read on for the full review. 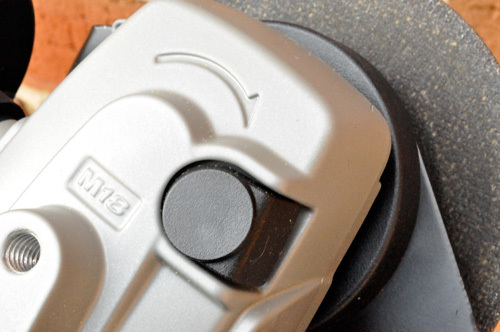 If you start looking around in the world of small angle grinders, you’ll see more and more paddle-switches because they are very comfortable to use in a variety of positions. Plus, by positioning the switch farther down the body, you gain better control. 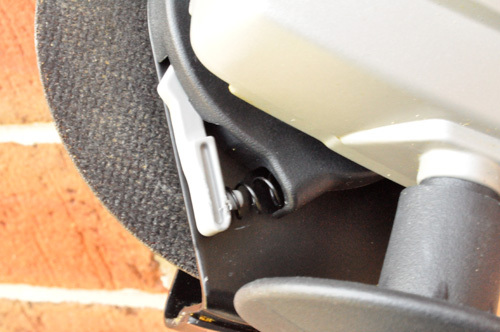 Paddle-switches also eliminate the need for a lock-on button which is much safer. If you ever accidentally drop the grinder or lose control, the switch disengages as soon as it leaves your hand. On their website, Milwaukee states that they offer the “only cordless cut-off /grinder in the market with a paddle switch design.” So far I think that still holds true. I’m a huge fan of tool-less accessory changes. I hate grabbing a spindle wrench or an Allen wrench especially because I usually lose them after about a week. 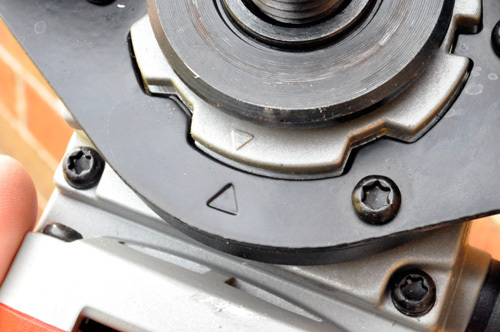 To remove the accessory, press the wheel lock and pull in the same direction it spins. You can also move the guard through a handful of detents with the press of a lever. To swap out the guard, just line up the arrows and it slides off. 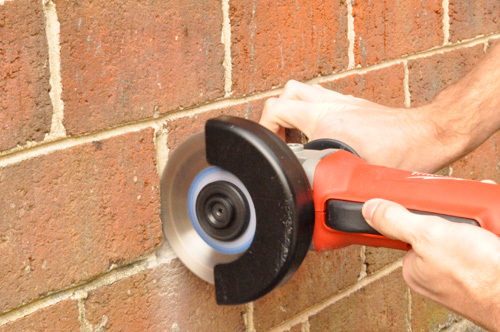 Grinders are great for welders, metal workers, masons and other professionals, and they’re commonly used for tasks like cutting rebar, polishing metal, tuckpointing, and more. 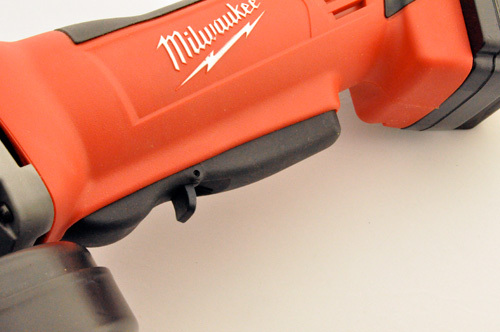 For these demanding applications, Milwaukee included a 4-pole motor that delivers 9,000 RPMs (no load). I tried out this grinder for cutting copper pipe and threaded rod, and removing some brick mortar. 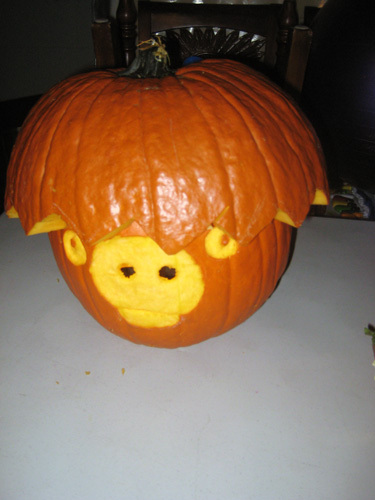 It performed admirably every time. There are a couple odds-n-ends I wanted to mention. 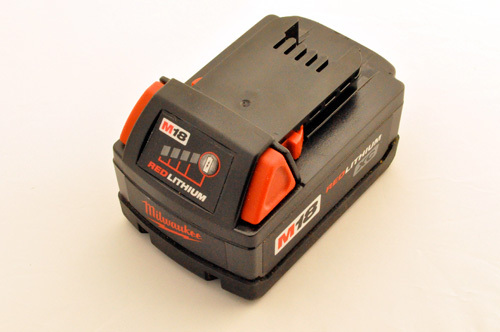 First, I appreciate the 3.0 amp hour M18 batteries because they put out a lot of juice. Second, Milwaukee included overload protection so that this grinder doesn’t burn out in “abusive situations.” It’s almost a standard feature for grinders, and I wanted you to know it’s there. 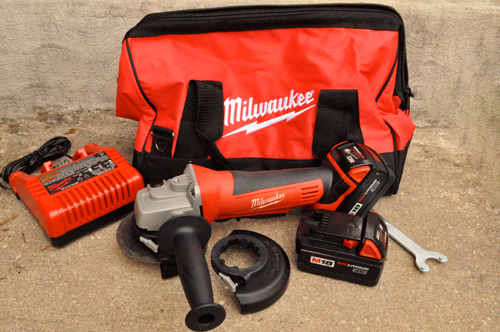 To see all the product information, check out the details on the Milwaukee site. How does it feel power-wise when comparing it to corded grinders? Every grinder I’ve ever used has been corded. Is it comparable in almost every way except for the cord? It doesn’t feel as powerful as a corded grinder. I didn’t have any problems cutting / grinding but you can tell it’s not quite the same. i am still toying with the idea of buying a cordless combo kit that includes a grinder… do you remember how it was not quite the same as a corded? We have some old pipes in our condo building that apparently were used for laundry machines when the building was apartments. They are capped off and allegedly no water runs through them anymore. They are in the way of us being able to utilze the brick wall they are attached to. I wonder if this would be a good way to cut them free. 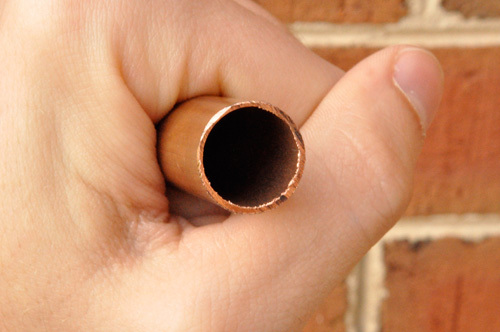 I really love the grinder but there are easier ways to cut the copper pipe. If you’re looking for an excuse to pick one up… go for it! Looks like this might come in handy for repairing an outside, free-standing fireplace/ grill once I begin to add some more rock to repair areas where it’s crumbled.